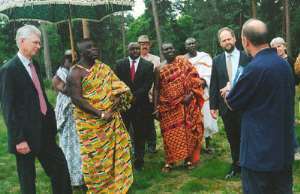 The Okyenhene, Osagyefuo Amoatia Ofori Panin has said in Cambridge, United kingdom that the viability of the economies of developing countries are dependent on their natural environment. “It is therefore of critical importance to manage the interface between the needs of man and wildlife in a manner that would effectively preserve the rainforest and natural habitat for posterity” said the Okyenhene. Okyenhene Amoatia Ofori Panin made this observation during interactions with officials of the Secretariat of Birdlife International in Cambridge while on a short working visit to the United Kingdom. Birdlife International is a non-governmental organisation committed to achieving conservation through advocacy, capacity development and awareness creation through its partner organisations spread across the world. The Okyenhene was accompanied by Nana Afari Duodu, Pusupusuhene, Barima Ofori Kuma, Tipinhene, both of the Akyem Abuakwa Traditional Area, Nana Fredua Koomson, a royal of Akyem Abuakwa and Mr. Emmaunel Antwi , First Secretary, Political and Economic Section of the Ghana High Commission. Also present at the meeting were Dr. Michael Rands, Director and Chief Executive of Birdlife International; Dr. Leon Benun, Director of Science and Policy, also of Birdlife InternationaI and Mr. Graham Wye , Chief Executive of Royal Society for the Protection of Birds (RSPB), a local partner organisation of Birdlife International. Other eminent personalities present at the meeting were Dr. Peter Schei, Chairman of Birdlife Council and other members of the Council namely Mr. Paul Matiko, representative of the Kenya National Reserve; Mr. Asad Rahmani, Bombay Natural History Society, India and Mr. Joseph de Hoyo of the Wildlife Council of Spain. Osagyefuo stressed that the fight against environmental degradation posed a major challenge in these countries and called on traditional and political leaders, civil society as well as allied organisations to join hands to bring about the desired behavioural and attitudinal change. “I have been lobbying to get the government to clamp down heavily on people who continue to flout environmental regulations and to empower individuals to take an active part in protecting our environment” noted the Okyenhene. Osagyefuo Amoatia Ofori Panin noted that the Okyeman Forest Brigade and the Okyenhene Conservation Week were making significant contribution to the protection of the biodiversity in the Akyem Abuakwa Traditional Area and called on Birdlife International to arrange a training programme for the Brigade. On celebrations lined up to commemorate the fifth anniversary of his enstoolment as Okyenhene later in October this year, Osagyefo announced that the week-long festivities would be used as a platform to disseminate information on environmental issues. In his presentation, Dr. Rand dwelt at length on the structure and operations of Birdlife International, which was principally engaged in generating strategies and resources to support the work of its global partners including the Ghana Wildlife Department. The Chief Executive observed that survival of mankind was inextricably linked to the natural environment and urged all partners to exert pressure at all levels of government to bring world leaders to focus attention on the grave environmental dangers confronting the world. On his part, Dr. Schei described Okyenhene as a key ally in the crusade against environmental degradation and pledged that the Birdlife Council would continue to support his campaign to preserve the natural habitat. Dr.Michael Rands presented Osagyefuo Amoatia Ofori Panin with a publication produced by Birdlife international entitled "Threatened Birds of the World" after the discussion.